1. Animals farmed for their fur suffer a life of mental and physical pain caused by cramped, inadequate housing and a cruel, merciless death – intelligent, feeling beings like family dogs and cats, treated like a product. 2. Despite fur industry claims methods of killing are quick, the evidence is clear that these animals are terrified as they face a cruel death – intelligent, feeling beings, capable of suffering, killed for an unnecessary product. 3. 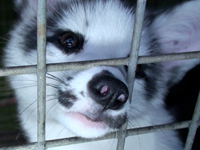 Over 15 million foxes are killed for their fur in a year, usually used for trinkets, trims and accessories. Up to 35 foxes are used to make a fur coat. 4. The majority of people are against the wearing of real fur (74% in the UK, 57% in the US) but the cheap cost and lack of labelling can dupe and confuse consumers into thinking fur products are fake. 5. Fur is never humane. When you buy fur you buy cruelty.